This is one of the funniest books I've read in my entire life. Reggie Levine is the likable bouncer at The Henhouse and just wants to disappear into the men's room with his magazine and do his business. Unfortunately, he's unable to do that. Local used car guru Harry is busy getting his head dunked in the only toilet bowl available and it's making a damn mess. 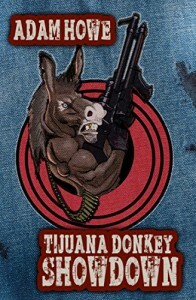 So begins Tijuana Donkey Showdown. This story was fast paced and in your face! I recommend it to fans of down and dirty stories that leave no holds barred. You might be offended, you might think it's disgusting, but I guarantee you this-you WILL be laughing. Well done, Mr. Howe! Well done!